The San Francisco Bay Area may be known for its big cities and sweeping mega bridges but did you know there are 11 great national parks installations in the Bay Area? 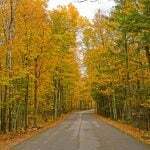 These special places preserve nature and history for current and future generations to enjoy. From legendary prisons to towering redwood forests, here is your guide to the national parks in the Bay Area. 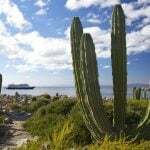 Trekaroo’s hotel tip: Many of these National Park locations require a car to drive to. You might want to consider staying at a hotel outside of San Francisco for part of your stay in the Bay Area. Marin, Oakland, and South San Francisco are good alternatives. 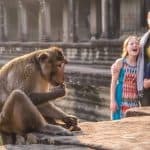 Trekaroo is an affiliate of Booking.com. 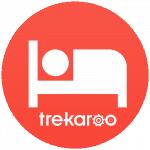 Thank you helping to keep Trekaroo free. 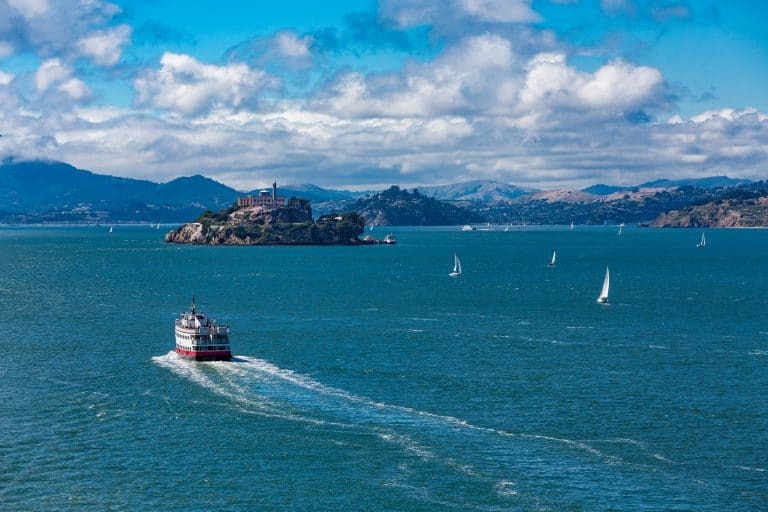 Hop aboard the ferry and rides across the San Francisco Bay to the legendary prison known as “The Rock”. Grab a seat on the top deck of the ferry for a great view but be sure to dress warmly because it can be quite chilly. Once on the island, stop by the information booth to pick up Junior Ranger packets. Bring some good walking shoes to climb the steep hill to the prison entrance. Once inside the prison, grab an audio tour headset for everyone, even the toddlers. There is no additional fee for the headset, and it is full of fun stories, sounds, and interactive elements. The history of Alcatraz is truly fascinating. Kids will love stepping inside a prison cell and imagining what life must have been like for the prisoners. Expect to spend a couple hours exploring the prison and the rest of the island. Bonus: You’ll get some amazing views of the San Francisco skyline. The park entrance is free, but you do have to purchase ferry tickets to the island through alcatrazcruises.com. You can purchase tickets 90-days in advance. They sell out quickly, so plan ahead. If tickets available for your preferred dates, keep checking the website for last-minute cancellations. 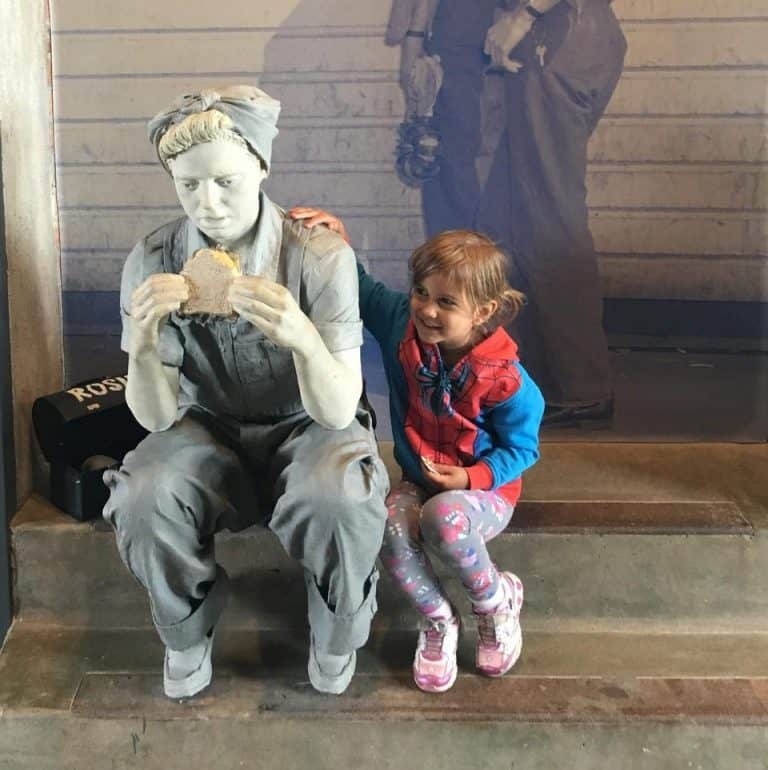 Find more great tips for visiting Alcatraz Island with Kids. 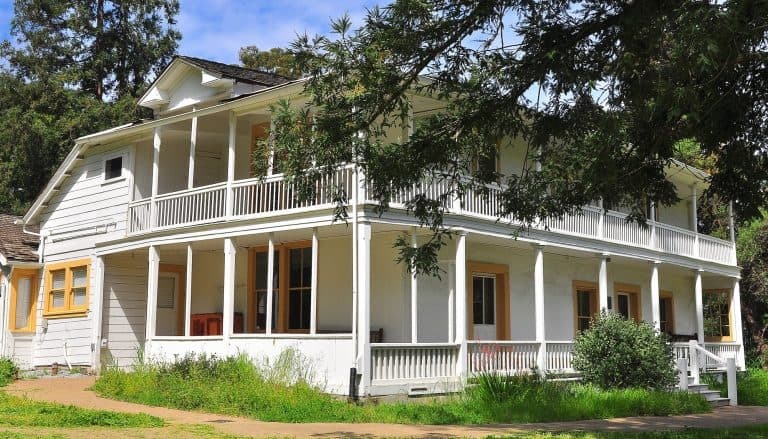 You don’t have to know anything about this famous playwright to enjoy his home in Danville, California. At this National Historic Site, a ranger guides visitors through O’Neill’s house and tells them about his life. Tour groups are small, so the guide tailors his information depending on your children’s ages. My kids loved hearing stories about Eugene’s dog, Blemie. Be sure to ask for your Junior Ranger booklet at the beginning of your tour. You’ll need to take note of items inside the house. Wear comfortable walking shoes. You’ll want to explore the spacious and beautiful grounds. Visitors can only access this home by NPS shuttle. Check the Eugene O’Neill NPS website to see current tour times and make shuttle reservations. It is suggested that visitors make reservations two weeks in advance, but it is possible to get a reservation on short notice. Park entrance, shuttle, and tour are free. Sitting below the southern portion of the Golden Gate Bridge is Fort Point, an old defense outpost. It was built for the Civil War and used through World War II. The fort never saw battle but serves as an important piece of Pacific maritime history. Take a self-guided tour using a booklet from the fort or a join guided tour. Be sure to watch the 28-minute video about the construction of the Golden Gate Bridge. Entrance to the fort is free. Although this area encompasses many of the national parks in the Bay Area, there are additional exciting adventures to be had. The Marin Headlands has beautiful hikes that take you past abandoned military batteries which make for great places for imaginative play. The views of San Francisco and the Golden Gate Bridge from atop the bluffs are spectacular. 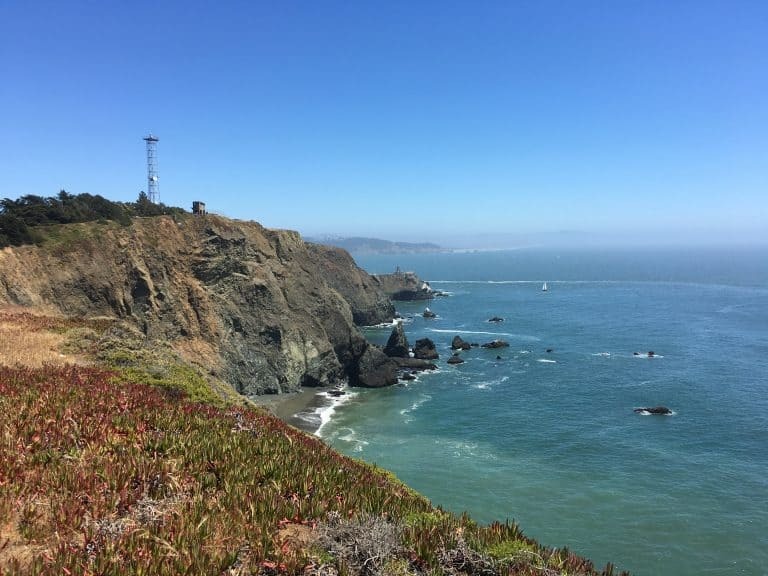 Stop by the Marin Headlands Visitors Center to pick up a junior ranger packet specific to the headlands. The beaches of the Golden Gate National Recreation Area are family-friendly and offer great views. For the best views of the bridge, visit Kirby Cove on the north side. On the south side, check out Ocean Beach. Build sandcastles, fly kites, or just take a stroll on 3.5 miles of white sand beaches. Due to hazardous currents and cold water, rangers don’t recommend swimming. If you visit a beach, kids can earn a Beach Buddies Junior Ranger Badge. Packets and badges are available at the Lands End Lookout Visitors Center. All the junior ranger packets for the Golden Gate National Recreation Area can be printed from the National Parks website. Check the website for closures and area warnings before heading out. Want more ideas for adventures in the largest of the National Parks in the Bay Area? Read all about the Kid-Friendly Presidio of San Francisco. National Park lovers need to stop by Martinez, California and pay homage to this great conservationist. If you don’t know a lot about John Muir, read one of the many kid-friendly biographies before you visit. This will make this site more exciting for your family. The Junior Ranger packet includes a scavenger hunt through his former home and exploration of the ranch. Muir would send clippings of plants he found on his travels back to his ranch to be planted. The grounds have many unique plants, including a 100-year-old giant sequoia. Park entrance is free. There are tables to enjoy a picnic. Although the park hours are 10AM-5PM daily, guided tours only happen at 2PM on weekdays, 11AM and 2PM Saturdays and Sunday. 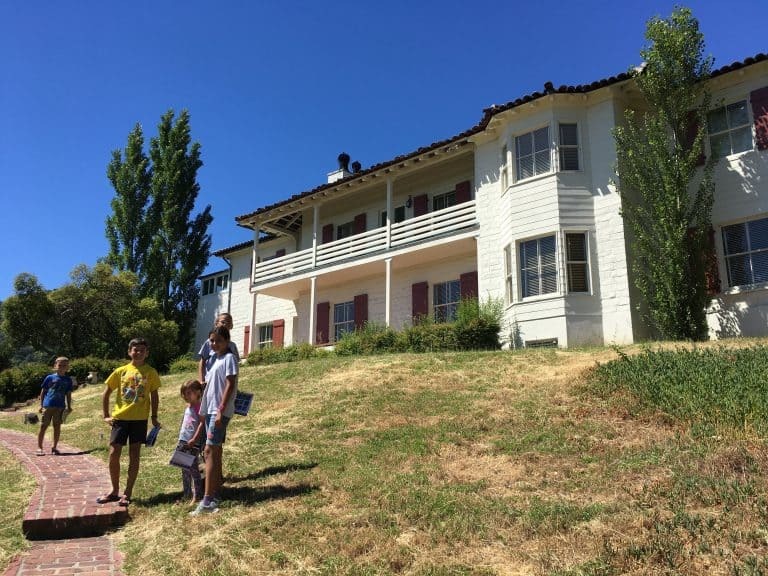 The only permanent exhibit for this 1,200-mile historic trail is located in the Martinez Adobe at the John Muir Historic Site. A detailed diorama and interactive displays about life in Anza’s expedition party fills the bottom floor of the home. Plan to send a fee minutes here while visiting the Muir ranch. There might not be rangers inside the adobe, but you can just walk straight in. Complete the Junior Ranger program for the trail online. When you finish, your official Anza Trail Junior Ranger badge will be mailed to you. 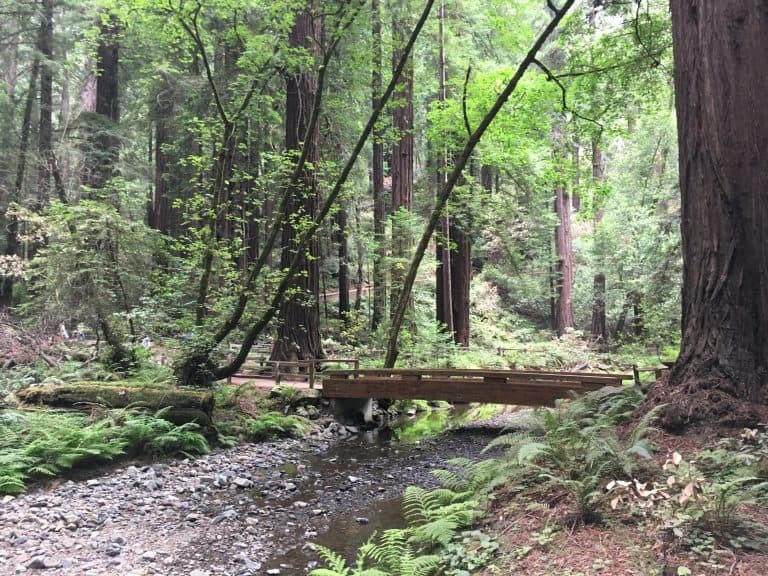 The dense forests and towering redwoods of Muir Woods make it one of the most unique national parks in the Bay Area. The main trail within the park is a loop that can be crossed at 3 points. Choose a ½ hour, 1 hour, or 1 ½ hour hike. The boardwalks along the loop are stroller friendly. In addition to the Junior Ranger program, kids can also complete Redwood Discovery: A Quest at Muir Woods. In this fun, free activity, families solve riddles and find a treasure box. Due to its close proximity to San Francisco, this redwood forest is an incredibly popular destination. Parking must be reserved in advance through gomuirwoods.com. Visitors ages 16 and up are required to pay an entrance fee. The forest stays cool so bring your jackets. No picnics allowed, but feel free to eat at the cafe on site. Trekaroo families love Muir Woods! Read reviews and add your own. The largest domestic loss of life during World War II occurred at the Port Chicago Naval Magazine in 1944. An explosion killed 320 sailors and civilians instantly. This park is dedicated to their memory. Your tour here explains the Port Chicago disaster and its effect on the United States Navy. Unlike other national parks in the Bay Area, Port Chicago does not currently have a Junior Ranger program. You can earn trading cards about Port Chicago by visiting the park. Access is open only to U.S. citizens and requires a reservation. Reservations must be made at least 2 weeks in advance. 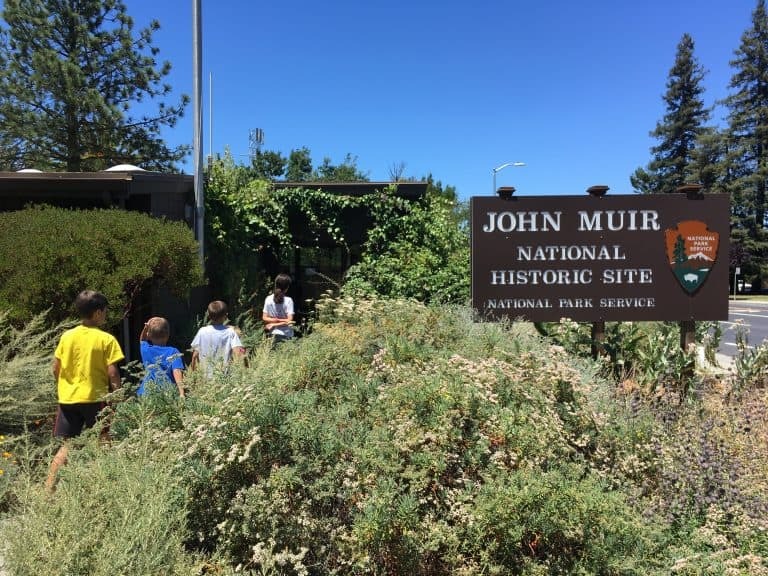 Tours meet at the John Muir Historic Site and are transported by shuttle to Port Chicago. Tours take about 90 minutes. 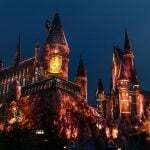 Tour and entrance require no fee. North of the hustle and bustle of San Francisco, visitors will discover the quiet beauty of Point Reyes. Rugged and rural, Point Reyes is a place where the only traffic is caused by crossing dairy cattle. This is the California coast of yesteryear, a sanctuary for native flora and fauna. The park is home to over 150 miles of trails, including our favorite for families, the Tomales Point Trail. 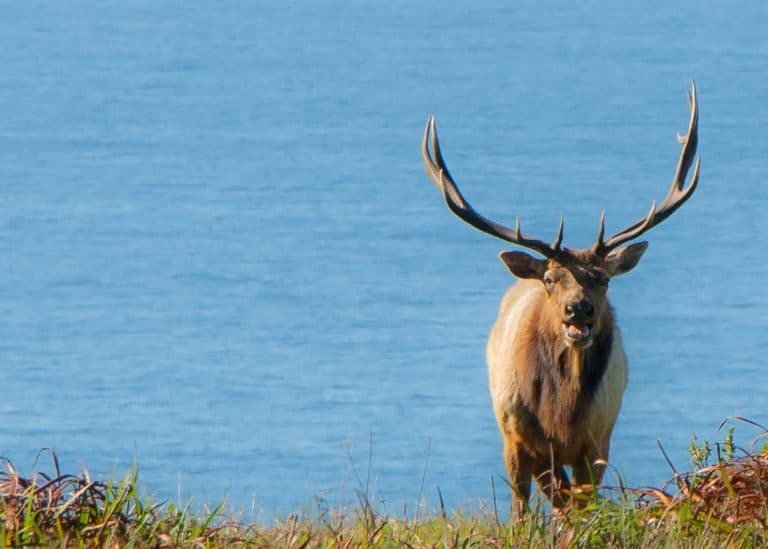 This 2-mile trail features sweeping views of the Pacific and a good chance of spotting the native Tule Elk which frequent the area. A winter (December through March) visit to Point Reyes brings the opportunities to spot migrating whales and witness a boisterous breeding colony of elephant seals at Drakes Beach. Seals and sea lions can also be found on the area beaches. Kayaking is a popular activity, especially on Tomales Bay. Kayak rentals are available, as well as guided tours. Arrive in the morning to avoid the winds that tend to pick up as the day progresses. Of course, no trip to Point Reyes is complete without a visit to the Point Reyes Lighthouse. A sunset visit is especially beautiful. There is a Junior Ranger program. Booklets can be picked up at any of the park’s visitor centers. 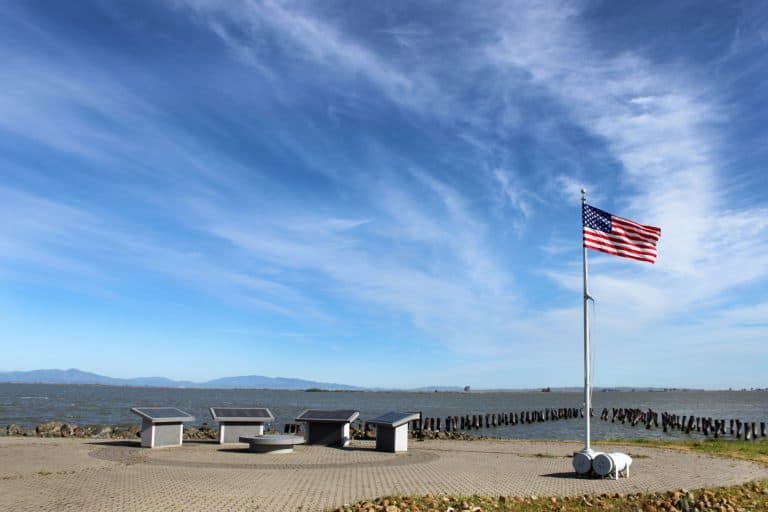 You’ll find this park tucked away in an industrial warehouse on the waterfront in Richmond, California. It is a fun place to learn about how life in the USA was impacted during World War II. In the basement, a few alternating videos tell stories about life during the war. Upstairs are fun, interactive exhibits that let your family get into the WWII home front action. The Junior Ranger program requires that you watch a video and explore the waterfront outside. The wind can be cold, so be prepared and dress appropriately. Even though this site is small, plan to spend a couple hours here. The exhibits keep kids and adults entertained. It can be tricky to find this site. Keep going all the way to the back of the warehouse compound. Walk around the building to the waterfront to find the entrance. Entrance is free. As the newest of the National Parks in the Bay Area, visitors can expect expansions in the future. At the San Francisco Maritime National Historical Park you can visit historic ships, play at the beach, and learn all about life at sea. Start off at the visitors center to pick up your Junior Ranger packet. The rangers will help plan your visit. 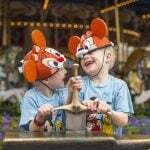 Packets can be returned to the visitors center, Maritime Museum, or the ticket booth on Hyde Street Pier. 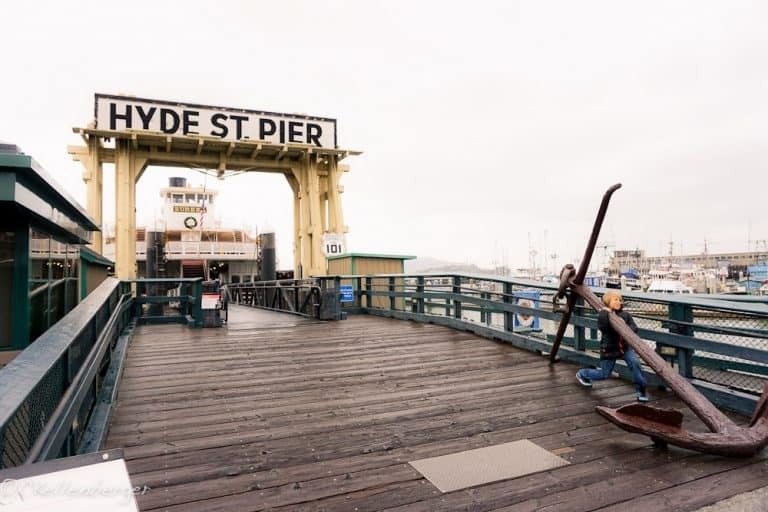 To visit the historic ships, visitors over 15 must purchase a ticket at the Hyde Street Pier ticket booth. The Maritime Museum and other park attraction are free. The park does not provide designated parking. Therefore you will need plenty of time to find a spot. Looking for more to do in San Francisco? 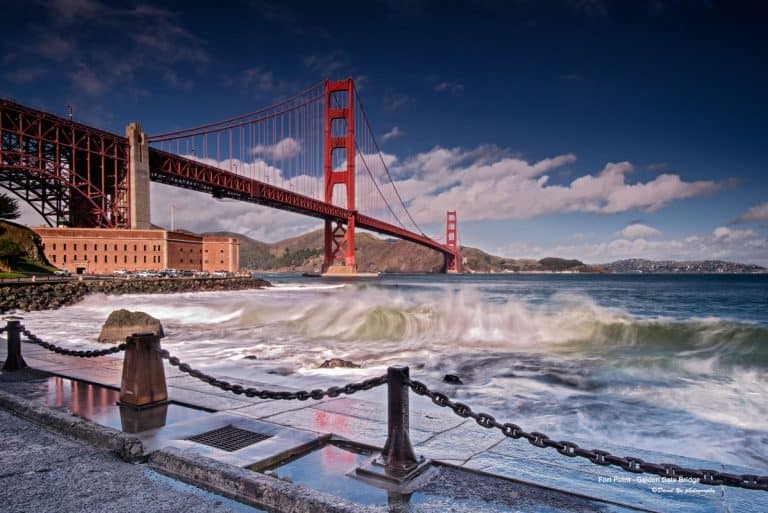 Check out the Top 10 Things for Families to do in San Francisco.